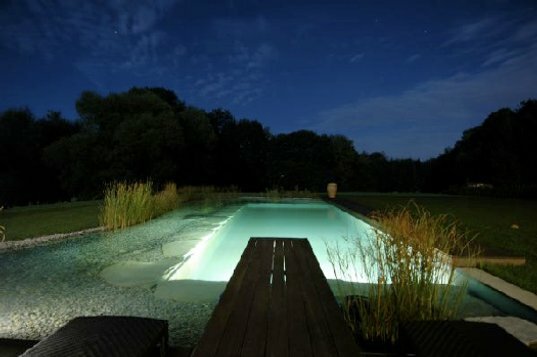 This gorgeous swimming pool isn’t a typical chlorine-filled watering hole–it’s actually a natural swimming pond that relies on plants to filter the water. (Don’t worry, you’re not swimming among the plants and stepping in squishy mud; the plant regeneration area is kept separate from the swimming area.) Even if you already have a swimming pool, you can enjoy the benefits of a chemical-free pond and relaxing natural environment using the structure you already have with a few design changes. A natural pond is usually larger than a normal pool to accommodate the plants, rocks, and natural vegetation that comprise the filter zone (separate from the designated swimming area). Once water filters through the plant zone, it is then pumped through a UV filter to ensure maximum cleanliness and aeration. Typically, natural ponds have a waterfall to pump water back into the swimming area. Design and shape options are endless. Whereas a conventional pool is little more than a concrete tub, a natural pond is a landscape centerpiece that will enhance the value of your home and quality of your life. What could be more beautiful than that? Great idea, as long as you can keep them pesky mosquitoes from taking advantage of it. West Nile virus bad : ) People good. Interesting idea for wet climates, but more water surface means more evaporation in dry areas. Most people don't know that pools evaporate 1/8 - 1/4 inch of water a day (30 plus gallons a day, depending on surface area). Also, more evaporation means more mineral buildup in the water over time... which would gradually kill plants. People should landscape using native plants and be water wise. I would love to know if this approach works in warmer climates, i.e. - Arizona? How warm can they be kept before the plants die off? Natural Swimming Pools I recently came across your blog and have been reading along. I thought I would leave my first comment. I dont know what to say except that I have enjoyed reading. Nice blog. I will keep visiting this blog very often. Do you know of any natural swimming ponds or swimming pools in the London area that are available to the public? Thanks! I liked these, then I found some swim ponds that looked more natural from http://www.aquahabitat.com/swimming.ponds.html I think we are conditioned to the appearance of a pool. When I saw I could have a stream, beach and fish, I started to lean more towards the aquahabitat people. I suppose it is just personal taste, but the paradigm seems to be shifting. I am officially in love with this site now. This is so cool. I want one. Probably smells better than a chlorine-filled pool, too. What's the maintenance like, though? I've heard taking care of a conventional chlorine pool can be quite a headache. It sounds like this isn't exactly "set it and forget it," but I wonder if it's not as bad. This gorgeous swimming pool isn't a typical chlorine-filled watering hole--it's actually a natural swimming pond that relies on plants to filter the water. (Don't worry, you're not swimming among the plants and stepping in squishy mud; the plant regeneration area is kept separate from the swimming area.) Even if you already have a swimming pool, you can enjoy the benefits of a chemical-free pond and relaxing natural environment using the structure you already have with a few design changes.